We make this bonda with Maida flour. My grandma used to make this every other week. She is an expert in this recipe. Here is the recipe. 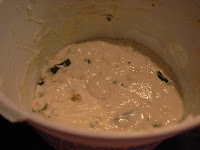 Mix maida flour + salt + buttermilk into a fine thick paste. If the buttermilk is really sour, we can mix the flour with buttermilk at the time of preparation. If its not that sour, its better to mix it 2 hours before preparation(in summer) or 4 hours before preparation (in winter). At the time of preparation, take a small seasoning pan, preheat a drop of oil, add mustard seeds, when it splutters add green chillies, asafoetida powder and curry leaves and pour it on top of maida batter. Mix it well. 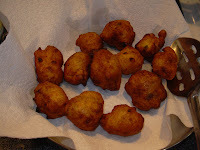 Take a wide pan, pre heat oil, make a small lemon sized balls with the maida batter and deep fry it till golden brown. Serve it hot with some chutney. This bonda should be served always hot. Otherwise it will become hard to eat.